In the midst of my frenzied updating, I realised that I hadn’t put up on the ol’ blog what I did 3 months ago. 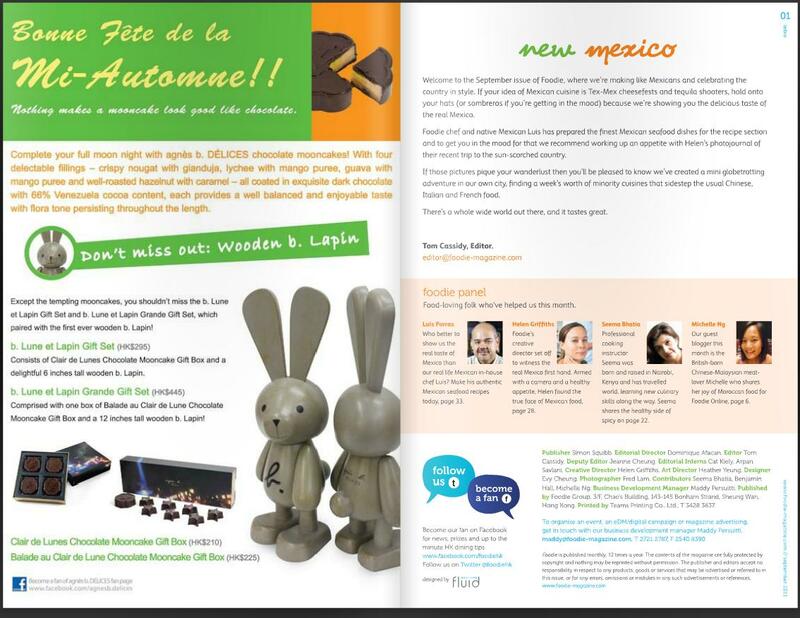 It was a tiny thing, but an exciting extra bit of writing I did on the side for the September issue of Foodie Magazine. Yes, it is now December, but hey, better late than never for updates 😛 Anyway, I was very happy to be asked to write a short piece on Sahara, as the focus of the September issue was minority cuisine in Hong Kong. I got my writing displayed in the Blogspot column. You can just about see my lil’ face too! Whoop. Thanks for the opportunity Foodie! 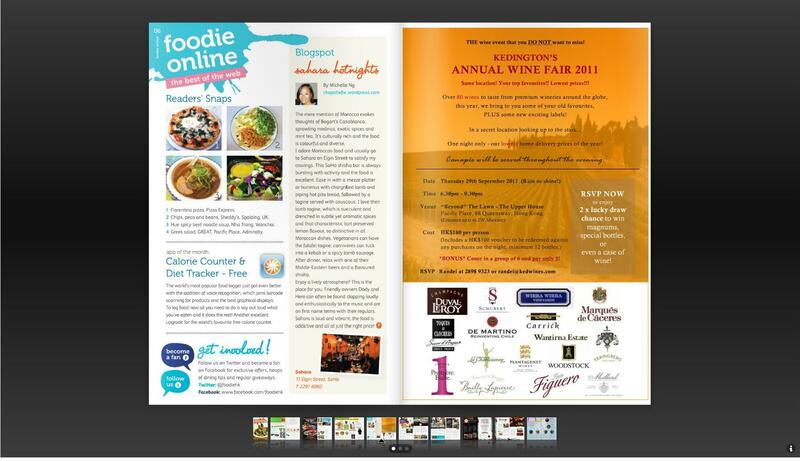 Find out more about Foodie Magazine here. Categories: About | Tags: Foodie Magazine | Permalink. I was just typing away at the keyboard, mulling over how time flies and berating myself over how little I seem to have done on the blog in the last couple of months, when I realised something was amiss. It’s 3 days before the end of March and a thought struck me that I’d forgotten something. Something fairly important to me, perhaps not to the masses, but a milestone nonetheless. Then I remembered. It’s the blog’s 1st birthday!!!!!!!! And I’d missed it by 9 days. Oops. So, now I feel like a negligent mum who forgot to buy the birthday cake and presents for their child. A year ago, Chopstixfix started out as a faithful record of my most memorable eats, and mostly because I simply couldn’t identify where I’d taken all the photos, without writing about them! And now, a year and 9 days on (hehe), it’s so much more. Thank you so much to all of my friends who eat with me and patiently wait while I take blurry photos of the food- without you, there’d be no Chopstixfix. And a special thanks to Sassy Hong Kong for giving me a wonderful opportunity to eat for others and not just for myself. I hope you all continue to enjoy the blog and please keep the comments and questions coming! Categories: About | Tags: Chopstixfix, Sassy Hong Kong | Permalink. Chopstixfix’s 3rd review for the HK Spotlight! My 3rd and final review for the World’s 50 Best Restaurants’ HK Spotlight is now up! As most of you know, I love this place, so it was an obvious choice for me to submit Ku-Suya Rakuen for recommendation to the foodie masses! To see my original review, see Okinawa surprise. Categories: About, Japanese | Tags: Hong Kong, Ku-Suya Rakuen, Okinawan food, World's 50 Best Restaurants | Permalink. Chopstixfix’s 2nd review for HK Spotlight! My 2nd review for HK Spotlight /World’s 50 Best Restaurants has just gone up! A far cry from the spice of Yu Chuan, my recommendation this time is Riquiqui, the French private dessert kitchen. The review on Riquiqui will be up on Chopstixfix soon! Categories: About, Dessert & Puddings, Private kitchen | Tags: french dessert, Hong Kong, Riquiqui private dessert kitchen, World's 50 Best Restaurants | Permalink.